The purpose of this article is to examine California’s three forms of direct democracy, which are set forth in Article 2 of the state constitution. California’s forms of direct democracy play a critical role in state governance and the legislative process. There are important provisions found in Article II, as well as a number of appellate court decisions that interpret these provisions. Article II deals with four topics: voting, initiative, referendum, and recall. Part l addressed initiatives. Part ll addresses referenda and recalls. The referendum is the power of the electors to approve or reject statutes or parts of statutes except urgency statutes, statutes calling elections, and statutes providing for tax levies or appropriations for the usual current expenses of the State. A referendum measure may be proposed by presenting to the Secretary of State, within 90 days after the enactment date of the statute, a petition certified to have been signed by electors equal in number to 5 percent of the votes for all candidates for Governor at the last gubernatorial election, asking that the statute or part of it be submitted to the electors. In the case of a statute enacted by a bill passed by the Legislature on or before the date the Legislature adjourns for a joint recess to reconvene in the second calendar year of the biennium of the legislative session, and in the possession of the Governor after that date, the petition may not be presented on or after January 1 next following the enactment date unless a copy of the petition is submitted to the Attorney General before January 1. The Secretary of State shall then submit the measure at the next general election held at least 31 days after it qualifies or at a special statewide election held prior to that general election. The Governor may call a special statewide election for the measure. 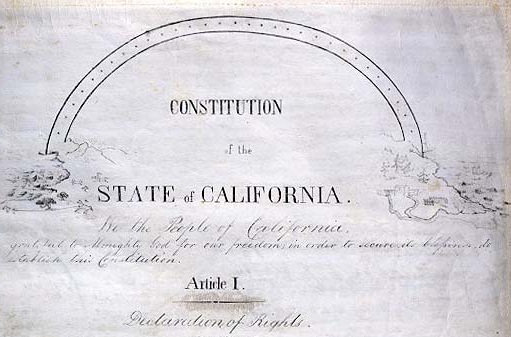 In California, the people have the power to approve or reject statutes or parts of statutes. Historically, most referendum efforts have either failed to qualify or have been rejected by the voters. An important note is that the filing of a valid referendum petition challenging a statute stays implementation of the statute until after a vote by the electorate. Proposing a referendum can be done to approve or reject (but reject is almost every instance when it is used) either entire statutes or parts of statutes. There are four types of bills that are not subject to referendum: urgency statutes, statutes calling elections, and statutes providing for tax levies or appropriations for usual current expenses of the State. An initiative statute or referendum approved by a majority of votes cast thereon takes effect on the fifth day after the Secretary of State files the statement of the vote for the election at which the measure is voted on, but the measure may provide that it becomes operative after its effective date. If a referendum petition is filed against a part of a statute, the remainder of the statute shall not be delayed from going into effect. If provisions of two or more measures approved at the same election conflict, the provisions of the measure receiving the highest number of affirmative votes shall prevail. The Legislature may amend or repeal a referendum statute. The Legislature may amend or repeal an initiative statute by another statute that becomes effective only when approved by the electors unless the initiative statute permits amendment or repeal without the electors’ approval. Before circulation of an initiative or referendum petition for signatures, a copy shall be submitted to the Attorney General who shall prepare a title and summary of the measure as provided by law. The Legislature shall provide for the manner in which a petition shall be circulated, presented, and certified, and the manner in which a measure shall be submitted to the electors. Just like an initiative, a referendum is done by presenting the referendum to the Secretary of State within 90 days after the enactment date of the statute. Before circulation of a referendum petition for signatures, a copy must be submitted to the Attorney General who then prepares a title and summary of the measure as provided by law. Referenda can qualify for the statewide ballot up to 31 days before an election. Since July 2011, referendum measures only appear on general election ballots. Once petitions are filed, county elections officials have 8 working days to determine a raw count of the signatures submitted and report their findings to the Secretary of State. The Secretary of State certifies the petition based upon the signatures collected. Once on the ballot, the law is repealed if voters cast more NO votes than YES votes on the referendum in question. A referendum approved by a majority of voters takes effect on the fifth day after the Secretary of State files the statement of the vote for the election at which the measure is voted on. If a referendum petition is filed against a part of a statute, the remainder of the statute is not delayed from going into effect. Initiative and referendum powers may be exercised by the electors of each city or county under procedures that the Legislature shall provide. This section does not affect a city having a charter. A city or county initiative measure may not include or exclude any part of the city or county from the application or effect of its provisions based upon approval or disapproval of the initiative measure, or based upon the casting of a specified percentage of votes in favor of the measure, by the electors of the city or county or any part thereof. A city or county initiative measure may not contain alternative or cumulative provisions wherein one or more of those provisions would become law depending upon the casting of a specified percentage of votes for or against the measure. No amendment to the Constitution, and no statute proposed to the electors by the Legislature or by initiative, that names any individual to hold any office, or names or identifies any private corporation to perform any function or to have any power or duty, may be submitted to the electors or have any effect. The source of the state electorate’s power to exercise the referendum is the constitutional provision governing that power. It is established beyond dispute that the power of referendum may be invoked only with respect to matters which are strictly legislative in character. The power of referendum is the power of the electors to approve or reject statutes, not the power to repeal a legislative act. Neither state statutes nor local ordinances subject to referendum go into effect during the time permitted for the filing of a referendum petition. A legislative act subject to referendum cannot be effective before the power of referendum can be exercised. A municipal referendum may review only legislative decisions, but not matters that are strictly executive or administrative. The initiative power is not a corollary to the referendum power in all circumstances, and thus a court is not required to imply the right to initiative where the right to referendum is expressly stated. The initiative allows voters to propose new legislation; in contrast, the referendum permits voters to reject legislation that has already been adopted. The prohibition against proposing referendum measures to approve or reject statutes calling elections did not apply to referenda petitions challenging reapportionment statutes. Because constitutional provisions reserving the referendum power to the people are self-enacting, the courts may properly devise procedures necessary to protect the power when the appropriate legislative body fails to establish such procedures. The referendum is the means by which the electorate is entitled, as a power reserve by it under the state constitution, to approve or reject measures passed by a legislative body. The scope of the referendum power is generally treated as co-extensive with the scope of the legislative authority; thus, any legislative decision made by a representative body is subject to referendum. A referendum may review only legislative decisions, but not matters that are strictly executive or administrative. There are two instances in which the power of referendum will be found to have been withdrawn. First, when there is a definite indication by the Legislature that it intends to preempt the discretion of a local legislative body to legislate. Second, when the Legislature, rather than preempt local legislative action, has instead sought to delegate legislative power so exclusively to a local governing body as to indicate its intent to preclude the citizens’ otherwise coextensive right of referendum. In determining whether the Legislature has abrogated the right of referendum in granting legislative authority to a local governmental body, the mechanical consideration of relevant factors must yield in favor of finding against preclusion was not the Legislature’s intent. The Legislature cannot reduce the referendum power reserved to the people by enlarging or increasing the type of legislation which becomes effective immediately. The referendum is the right reserved to the people to adopt or reject any act or measure which has been passed by a legislative body and which, in most cases, would without action on the part of electors become law. The referendum is limited in its operation to the adoption or rejection of legislation already enacted by a legislative body and, in the absence of such prior enactment, there can be neither rejection nor adoption by the electorate. For purposes of determining whether acts are legislative and thus subject to referendum process or whether acts are administrative and thus not subject to the referendum process, acts constituting declaration of public purposes and making provisions for ways and means of its accomplishment may be generally classified as calling for the exercise of legislative power, while acts of administration are those necessary to carry out legislative policies and purposes already declared by a legislative body. Although powers reserved to the people of initiative and referendum are to be liberally construed to uphold those powers whenever it is reasonable to do so, the people may involve the power of referendum only with respect to matters that are legislative; administrative acts are not subject to referendum. The California Constitution defines a “recall” as the “power of the electors to remove an elective officer.” Recall of a state officer is initiated by delivering to the Secretary of State a petition alleging reason for recall. Sufficiency of reason is not reviewable. Proponents have 160 days to file signed petitions. The state’s electors have the power to remove an elective officer which is initiated by delivering to the Secretary of State a petition alleging a reason for the recall. However, the sufficiency of the reason for the recall is not reviewable. A petition to recall a statewide officer must be signed by electors equal in number to 12 percent of the last vote for the office, with signatures from each of 5 counties equal in number to 1 percent of the last vote for the office in the county. Signatures to recall Senators, members of the Assembly, members of the Board of Equalization, and judges of courts of appeal and trial courts must equal in number 20 percent of the last vote for the office. The Secretary of State shall maintain a continuous count of the signatures certified to that office. An election to determine whether to recall an officer and, if appropriate, to elect a successor shall be called by the Governor and held not less than 60 days nor more than 80 days from the date of certification of sufficient signatures. A recall election may be conducted within 180 days from the date of certification of sufficient signatures in order that the election may be consolidated with the next regularly scheduled election occurring wholly or partially within the same jurisdiction in which the recall election is held, if the number of voters eligible to vote at that next regularly scheduled election equal at least 50 percent of all the voters eligible to vote at the recall election. If the majority vote on the question is to recall, the officer is removed and, if there is a candidate, the candidate who receives a plurality is the successor. The officer may not be a candidate, nor shall there be any candidacy for an office filled pursuant to subdivision (d) of Section 16 of Article VI. Thereafter, proponents have 160 days to file the signed petitions. A petition to recall a statewide officer must be signed by electors equal in number to 12 percent of the last vote for the office, with signatures from each of 5 counties equal in number to 1 percent of the last vote for the office in the county. Signatures to recall Senators, members of the Assembly, members of the Board of Equalization, and judges of courts of appeal and trial courts must equal in number 20 percent of the last vote for the office. An election to determine whether to recall an officer and, if appropriate, to elect a successor must be called by the Governor and held not less than 60 days nor more than 80 days from the date of certification of sufficient signatures. A recall election may be conducted within 180 days from the date of certification of sufficient signatures in order that the election may be consolidated with the next regularly scheduled election occurring wholly or partially within the same jurisdiction in which the recall election is held. This is allowed if the number of voters eligible to vote at that next regularly scheduled election equal at least 50 percent of all the voters eligible to vote at the recall election. Thereafter, if the majority votes to recall the state officer, then the officer is removed and, if there is a candidate, the candidate who receives a plurality is the successor to that office. The officer may not be a candidate. A state officer who is not recalled must be reimbursed by the State for the officer’s recall election expenses legally and personally incurred. In addition, another recall may not be initiated against the officer until six months after the election. The Legislature is granted plenary authority to provide for the recall election. The state constitution specifies that, if the Governor is subject to a recall petition, then the recall duties of that office are to be performed by the Lt. Governor. And, if the Secretary of State is subject to a recall petition, then the recall duties of that office are to be performed by the Controller. Pursuant to the state constitution, “the Legislature shall provide for recall of local officers.” However, counties and cities whose charters provide for recall are exempt from these provisions.